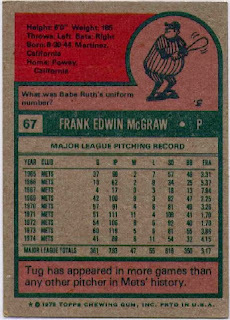 This baseball card set is a miniature replica of the regular 1975 set that includes 660 small size cards, which measure 2 ¼" by 3 1/8". 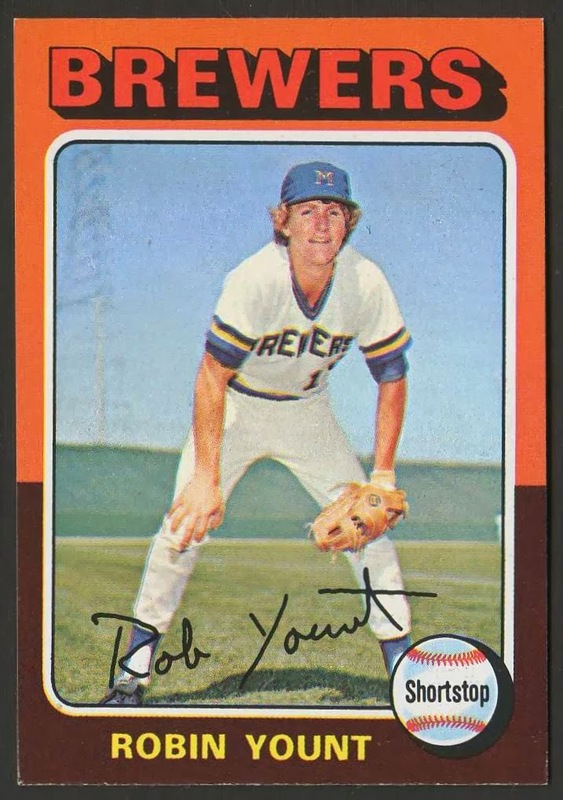 The subsets for the 1975 Topps Mini baseball cards are the milestone cards (1-7), MVPs (189-212), league leaders (306-313), playoff highlights (459-460), and World Series highlights (461-466). 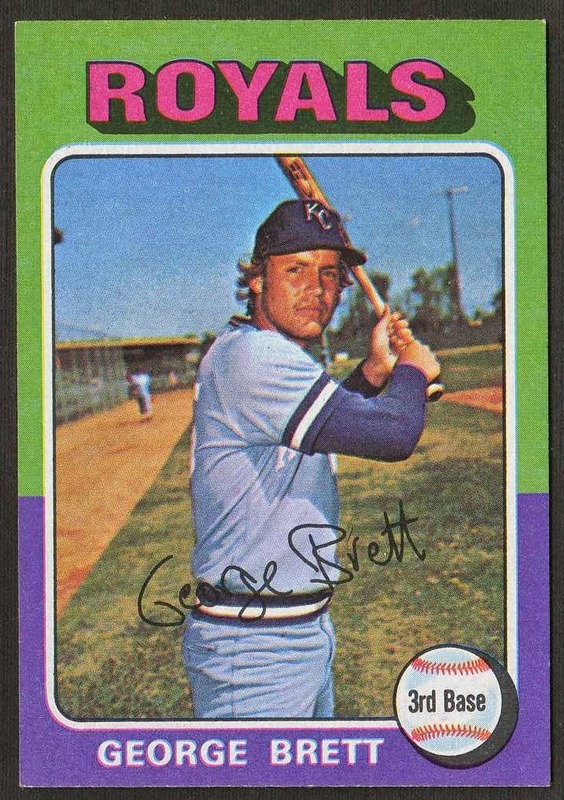 The key rookie cards from this set include #223 Robin Yount, #228 George Brett, #616 Jim Rice, and #623 Keith Hernandez. 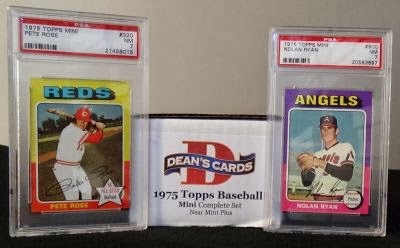 We have recently built a high grade 1975 Topps Mini Complete Set. It is the highest grade that is currently available. The set grades a Near Mint Plus. (7.5).To take a look at the set please click here. If you are interested in a custom set please go to our Contact Us page. From there, please select that you are interested in a custom set. This set was only introduced as one complete series. It includes 48 Hall of Famers with no variations. The 1975 Topps Mini Set is one of the most unique sets that Topps ever put out. The design of the cards is what makes this set, as well as the regular set pop out. When aligned in a set box, it looks like a prism of colors. It features two color borders that surround the player. The team name at the top has a 3d effect with its bold lettering. The featured baseball tells you the player's position at the time. The player's facsimile signature is written across the front. The backs feature the stats of the player as well a comic that has a trivia question. The color scale consist of a red and green solid over a grey. This is the most pristine 1975 Topps Mini set that we've seen in years. Most of the cards appear to be pack fresh, and none of the cards in this set grade less than Excellent/Mint. Most of the cards in this set grade in the Near Mint to Near Mint/Mint range, and the star cards are a good representation of how the cards in this set appear. To view the star cards please click here.